Metalware, melamine, glass, ceramics, linens; versatile Beatriz Ball branded items fit perfectly into today’s more casual entertaining--ideal for the way we live now. Five-time winner of the ARTS Award in Tabletop category, our products were chosen as one of Oprah’s Favorite Things in 2017. Beatriz Ball is reinventing melamine … again! 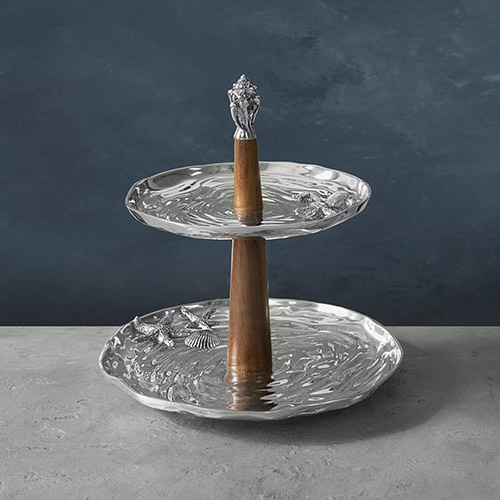 The fabulously functional 6-piece Nube (Spanish for “cloud,” and pronounced, “noo-beh”) Collection features sculptural works of art rendered in a luscious satin finish. 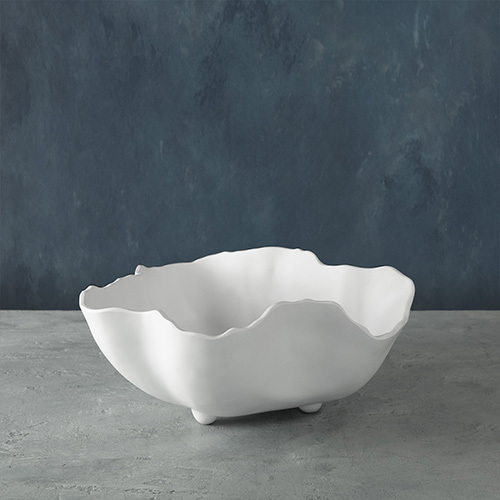 The Nube collection of luxury melamine includes three bowls, an ice bucket, salad servers, and a chip and dip that are as practical as they are beautiful. 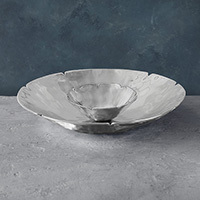 This fabulous large bowl makes a stunning centerpiece. Dishwasher safe (top rack), heavy-weight, break resistant and durable, food safe, BPA and PABA free. Beatriz Ball is reinventing melamine … again! The fabulously functional 6-piece Nube (Spanish for “cloud,” and pronounced, “noo-beh”) Collection features sculptural works of art rendered in a luscious satin finish. 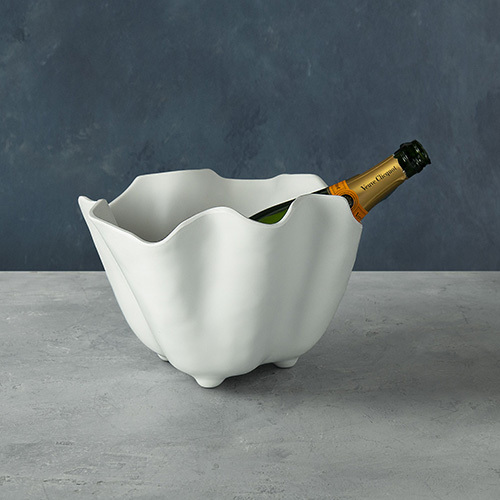 The Nube collection of luxury melamine includes three bowls, an ice bucket, and a chip and dip that are as practical as they are beautiful. This generous ice bucket is great for chilling wine and is a striking accessory on the bar. Dishwasher safe (top rack), heavy-weight, break resistant and durable, food safe, BPA and PABA free. 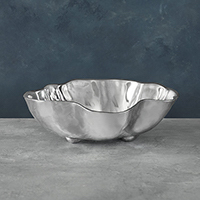 A stunning, multi-functional bowl that is destined to become a bestseller! The striking sculptural forms of items in Beatriz Ball's multifunctional SOHO Onyx Collection are a perfect match for the lifestyle demands of today. The brilliant, artisan-crafted pieces feature sloping, undulating sides that open up to reveal the beauty of the contents inside. Artfully designed with four feet that gently elevate the sensuous designs, they are the very essence of versatility. Original designs by Beatriz Ball handmade of a top quality, FDA safe, easy-care, oven and freezer friendly aluminum alloy. Stock up on this fabulous chip and dip. The striking sculptural forms of items in Beatriz Ball's multifunctional SOHO Onyx Collection are a perfect match for the lifestyle demands of today. The brilliant, artisan-crafted pieces feature sloping, undulating sides that open up to reveal the beauty of the contents inside. Artfully designed with four feet that gently elevate the sensuous designs, they are the very essence of versatility. Original designs by Beatriz Ball, handmade of a top quality, FDA safe, easy-care, oven and freezer friendly aluminum alloy. 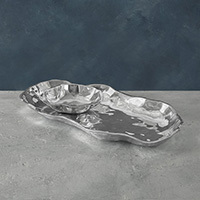 This towering ocean-themed item features two generous serving areas, topped by a metallic shell. With a surface resembling rippling sands, the piece is enlivened by clusters of sculptural starfish and seashells. Composed of sand-cast metal, and hand-finished wood, this original design from Beatriz Ball is perfect for the beach house. An original design by Beatriz Ball, handmade of a top quality, FDA safe, easy-care, oven and freezer friendly aluminum alloy. A beautifully hip chip and dip with a zen-like vibe. Inspired by natural forms, this brilliant, artisan-crafted piece is reminiscent of the lotus. A great, multifunctional, two-part piece totally in-sync with today's lifestyles. An original design by Beatriz Ball, handmade of a top quality, FDA safe, easy-care, oven and freezer friendly aluminum alloy.